Fresh Strawberry Cheesecake is not only delicious but it is a total show stopper! Just sit back and wait for all the oohs and ahhs you are going to get! In a bowl, combine pecans, graham cracker crumbs and butter. Mix and then press into bottom of 10 inch springform pan. Beat together cream cheese until smooth. Add in eggs, sugar, lemon zest and vanilla. Beat until combined. Spoon filling over crust into pan and bake for 40-45 minutes. Don't worry if it cracks in the middle! Remove from oven and cool at room temperature for 15 minutes. Leave oven on. Mix together sour cream, sugar and vanilla and blend together. Spoon topping over cake after cake has cooled for 15 minutes. Pour into the middle and extend to within 1/2 inch of edge. Leave part of the cheesecake layer showing. Return to oven and bake for an additional 5-7 minutes. Cool and then refrigerate for at least 24 hours or up to 3 days. Add cornstarch into a few Tablespoons of the jelly in a saucepan. Then add in remaining jelly, OJ concentrate and water. Stir over medium heat until thickened and clear. Cool until lukewarm. With a sharp knife, loosen cheesecake from edge of pan and remove springform. Arrange hulled strawberries onto of cheesecake. Spoon glaze over the berries, allow some of it to drip down the sides of cake. Refrigerate until ready to serve. 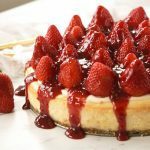 Strawberry Cheesecake was originally written by Leigh Anne Wilkes at https://www.yourhomebasedmom.com/fresh-strawberry-cheesecake/.